The whites gmz. 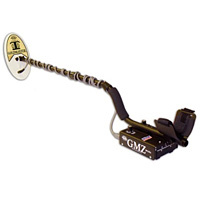 I bought the gmz because of it's 50khz. to work a long side of the gmt a 48 khz. The gmz is not as sensitive as the gmt. Air test on a bb the gmz a little short but you can work the same bedrock. It is quite until you swing over a target or hot rock. It has a beach or salt toggle switch. YOU CAN GROUND balance manually. The price around 450.00 new. Find on line. Good for someone starting out. Chester Mcintosh from Oroville, CA.